If you are trying to lose weight, you need to consume fewer calories than you burn off. Foods that have little or no carbohydrates and fat are among the best weight-loss foods because they are so low in calories. But don't cut out carbohydrates and fats completely; you need adequate amounts of these nutrients to support your health. Tuna fish, whether freshly caught or canned in water, is nearly all dietary protein and has virtually no carbohydrates and fat. The American Council on Exercise recommends canned tuna if you are trying to lose weight. 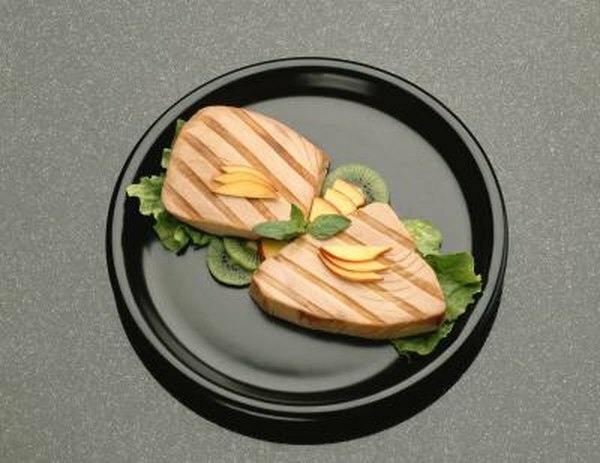 A can of tuna in water is 130 calories and provides 42 g of protein. Dr. Jonny Bowden, Ph.D. and clinical nutrition specialist, says in his book, "The 150 Healthiest Foods on Earth," that unlike other fish such as salmon that contain healthful unsaturated fats, tuna contains virtually no fat at all. But if you are trying to avoid dietary fat, make sure to eat canned tuna in water and not in oil. Egg whites are nearly completely free of carbohydrates and dietary fat and are almost 100 percent protein. The American Council on Exercise also recommends egg whites if you are trying to limit your carbohydrate, fat and caloric intake in order to lose weight. Each egg white is 4 g of protein and only 20 calories. The yolk, the "yellow part" in the middle of the egg, is also virtually free of carbohydrates but has several grams of dietary fat. The yolk is not "bad" for you, but you may want limit how many to eat to keep your caloric intake down. A yolk has about 80 calories and 6 g of protein. The yolk is also full of vitamins and minerals such as lutein for eye nutrition and choline, which helps support optimal brain function. Vegetables are nearly completely fat-free and healthful low carbohydrate sources. Many of the carbohydrates are in form of dietary fiber, which has no caloric value. Unlike tuna and egg whites, vegetables do not have high amounts of protein. Vegetables are ideal for weight loss because they are very low in calories and they contain small amounts of complex carbohydrates that will not raise your blood sugar, as well as small amounts of protein. The American Council on Exercise suggests artichokes, spinach and bok choy. Dr. Ann Kulze, a nutrition specialist based in South Carolina, recommends cabbage, kale, cauliflower, collard greens, onions, leeks, asparagus, dark lettuce and bell peppers. Nearly any type of vegetable other than potatoes is low in carbohydrates and virtually fat-free. Many people, especially inexperienced dieters, seek to eliminate all dietary fat and carbohydrates from their diet in order to lose weight. While this significantly reduces your caloric intake, it is not a healthy approach to dieting. According to Emory University, a healthy low-carbohydrate diet does not exclude fruits and vegetables. And while you do need to limit your fat intake, you still need adequate amounts of dietary fat, mainly in the form of healthful unsaturated fats. A low-carb or high-protein should include small amounts of carbohydrates and fat. Consult your physician or a registered dietitian if you need further assistance to achieve your weight-loss goals.